Hospitality Nylon and Hospitality Vinyl are two models in the Hospitality Series by BIA Mattresses that are available as either foam mattresses or innerspring mattresses. In a sense, these could be considered four models. 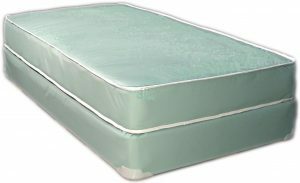 These are two-sided mattresses, which means more durability when they are flipped regularly, since the padding on each side hosts the sleeper(s) only half the time. It has time to recover before its next turn on top. The distinguishing feature between these two models is the covers. On one, it is made of nylon. On the other, it is vinyl. Vinyl has the advantage of being totally waterproof, as long as the seams are sealed. But a high-denier nylon fabric can be resistant or impermeable to liquids, yet still breathable. Also, the nylon may be less likely to crack and leak than vinyl. Both covers are listed as "Institutional." The support core of a Nylon or Vinyl Hospitality mattress is either a 5" layer of high density polyurethane foam or an innerspring of 390 coils in queen size. 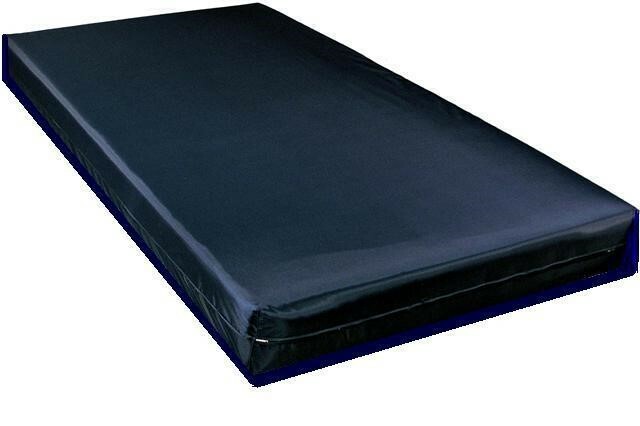 The polyurethane base foam is the same as the single core of the Hospitality Foam Mattress. Except for the low height, this is the most common support core for foam mattresses across the board. It is a very firm, very supportive material. And though a solid foam, it transfers less motion than Bonnells or continuous coils. The 390-count innnerspring is essentially the same support core as in BIAM's Presidential Two-Sided Series. The coil count is consistent with Bonnell coils, the least expensive innerspring type, as well as the oldest. The support core has an insulator pad of heavy duty material on each side. After this is a comfort level polyurethane foam topper, again on each side. These are smooth-top mattresses, with no quilting, keeping the cost down for institutional use. This means cost-effective sleeping support for a healthcare or educational insitution, or even a correctional facility. Hospitality Vinyl and Hospitality Nylon are covered by a BIA Mattresses warranty for 10 years, non-prorated.